Of the 40 Indian athletes in Rio, as many as 16 smashed the Indian record in the process of qualifying for the Games. Yet the distance to the 2016 best, a crude benchmark of medal hopes at Rio, remains formidable in most events. Notable exceptions are both the 4x400m relays, men’s 20km walk and men’s triple jump. NOTE: Timings/distances have been rebased to 100 to enable comparison. 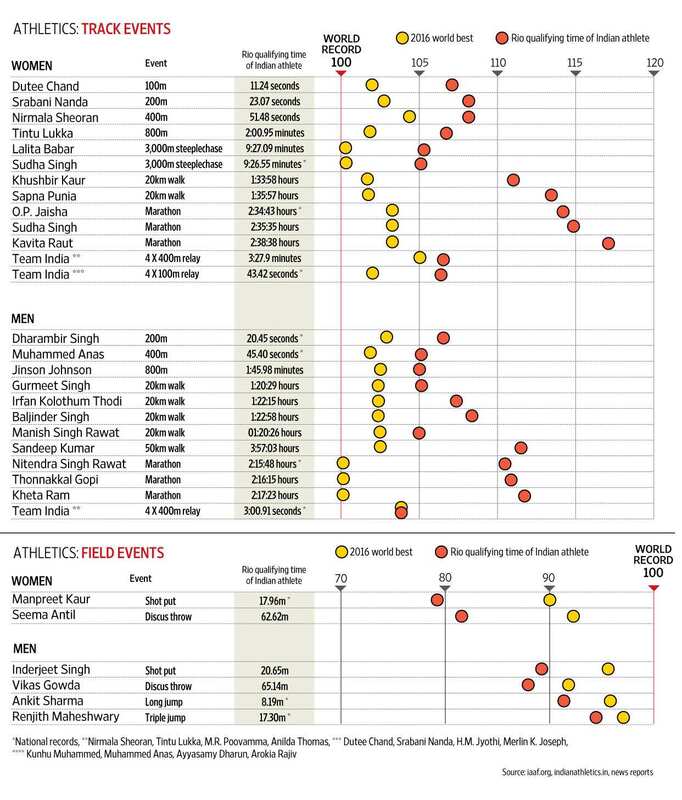 The value for the world record is taken as 100, and the time/distance of the 2016 world best and Rio qualifying time of the Indian athlete are scaled to it. In track events, the further the point for the Indian athlete is to the right (more time taken), the greater the distance to a medal. In field events, the further the point for the Indian athlete is to the left (less distance covered), the greater the distance to a medal.